In the original games, Gold & Silver, when the player got to Fuchsia City, they would discover that the Safari Zone Warden has moved and so the Safari Zone there has moved. 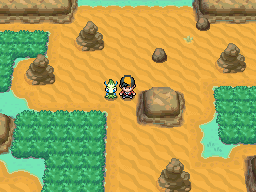 In Heart Gold & Soul Silver, we have found where the Safari Zone has moved to , it is now in the new area found west of Cianwood. The Safari Zone works in a similar manner to the previous Safari Zones with you being given 30 Safari Balls and sent into the Safari Zone with only a limited amount of steps. There are six areas in the Safari Zone and they all hold different kinds of Pokémon so you need to explore if you wish to get them all. 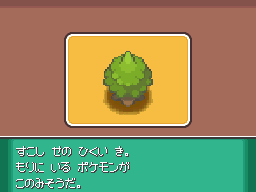 However, the Johto Safari Zone has a distinct difference. However, these Objects are not superficial and just for aesthetics, these items have the ability of drawing out certain Pokémon in each area if you place them right. You can place up to 30 items in each of the six Safari Zone areas so use them wisely to get the desired outcome for the Pokémon you wish. 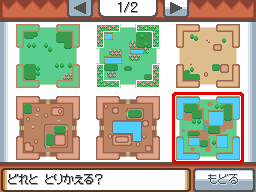 You can then see if the items have lured any Pokémon in the tile customisation computer. These Pokémon are typically of higher levels than the normal Pokémon. As time goes on, Baoba will continue to call you to provide you with more items. If you leave the areas open for set amount of days, the Objects you place in each area level up so they count as more. Once they're levelled up, you can switch without worry. As the areas level up, the amount of Objects that you require for the Pokémon decreases. For example, Lairon in the Cliff area requires 24 Peak Objects, but after 30 days, it only needs 12 Objects, having each block count as 2 Objects. The table below shows how this works. Below is a list of all the Safari Zone Block Items and what they manipulate.